Being a client centric enterprise, we are fully devoted in manufacturing, exporting and supplying a high performing array of Oil Filling Machine. This machine is manufactured under the stern guidance of dexterous professionals with the use of supreme quality components as per international quality standards. Widely used for filling different kinds of oils in an efficient manner, the offered machine finds application in automotive, construction and several other heavy duty industries. 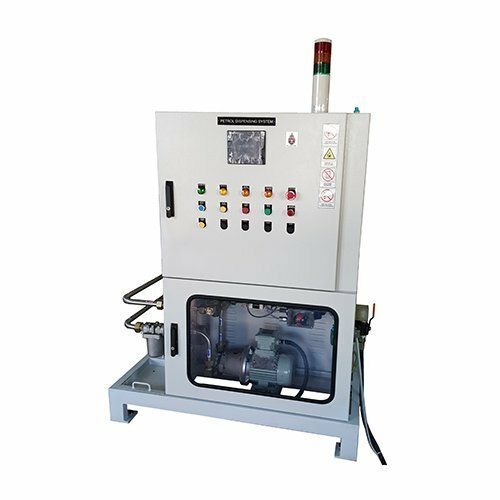 In addition, our patrons can purchase this Oil Filling Machine at reasonable prices from us. Most suited for filling Lube Oils, Diesel, Petrol, Coolant, and Transmission Fluids. Design suits fast accurate and precise filling of vehicle/components on moving assembly line. Fully automated with PLC control. Features include Barcode Scanner, Label Printer, Ethernet Data transfer. TPM compatible design suits automotive manufacturing plants. Can be interfaced with remote Server, Andon System or SCADA. Evacuation based models to suit Coolant, Brake, Clutch and Power Steering Oils and AC Gas. Filling of Gear Oil, Engine Oil, Transmission Oil on Gearbox and Transmission assembly lines. Filling of Diesel, Petrol, Coolant, Brake, Clutch and Power steering oil, on vehicle assembly Lines. High volume filling of Shock Absorber tubes and two-wheeler Front Forks. High volume Hydraulic Oil filling of Door Closer Assemblies. Additive + Oil filling in refrigerant Compressor Assemblies. Guided by the mission that “Knowledge of industry needs and the drive to innovate”, we, Fluidyne Control Systems (P) Ltd., are creating value-based solutions in precision industrial liquid flow measurement, with our world class portfolio of products. Forerunners in our business arena since 1995, we have been efficiently meeting multiple needs of clients belonging to a wide array of industrial sectors. Our long tradition of creating breakthrough solutions in the field of precision liquid flow measurement is well reflected in the quality and reliability of our products. Our range of Positive Displacement Flowmeters, Genset Efficiency Monitors, Liquid Dispensing & Filling Systems, Fuel and Solvents Unloading Systems, etc., is built around technology innovations. Offshoots of our consistent research practices and strict quality paradigms, our product range is the reason behind our indomitable brand image as a manufacturer, exporter and supplier on the global platform. With in-depth knowledge in mechanical, hydraulic & pneumatic engineering along with automation techniques, embedded electronics, software solutions and data communication, today, we are able to deliver products that are in perfect congruence with application needs of our customers. We also exemplify worldwide leadership in our domain by grasping and addressing any form of customized requirements on our product collection, exactly as per specifications provided by customers.